GoPro Hero review: The best affordable action cam for 2018? Despite some minor shortcomings in video quality compared to the full-fat GoPro lineup, the 2018 Hero is still a lot of fun and really easy to use. 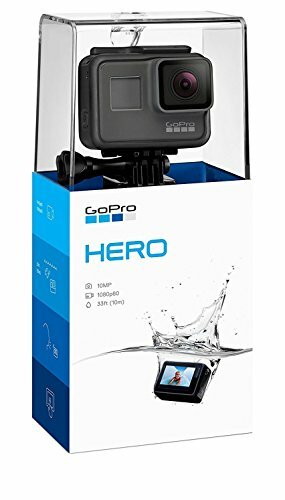 It'll make an ideal secondary GoPro for existing users, or a decent entry-level model for first timers - and it's this latter group which will no doubt be drawn to the more affordable Hero. Over recent years, GoPro has been working on diversifying its product range, trying to give as good an experience as possible at every price point. The high-end Hero action cameras offer the best photo and video quality, as well as touchscreen input and nifty features like voice control and Karma drone support. At the lower-end of the scale is the Session, which offers high-end capture, but in a smaller package without a screen. For 2018, GoPro has launched the new and cheaper GoPro Hero, which costs just £200, a significant cut compared to the aforementioned models. It looks just like a high-end Hero, though, and fits almost all of the same accessories, including that crazy Hot Wheels one. Budget camera in high-end clothing? The first thing you'll notice about the new Hero, if you're at all familiar with GoPro, is that it looks exactly the same as the Hero 6 and Hero 5. In fact, the only really difference visually is the model name printed on the side. That means the same small rectangular designed, covered in a grippy grey finish, with the square camera protrusion on the front, sat alongside the small monochrome information screen. Turn it around and you'll find the same small touchscreen viewfinder taking up virtually all of the space on the back. Other similarities include the placement of the two main buttons: the mode button, which does what it says on the tin, is still on one edge, while the capture/shutter button, complete with its red circle icon, is atop the camera within easy reach. With the 2018 Hero being a more budget friendly version of the Hero proper, you could be forgiven for assuming that there would be a drop in ruggedness and durability - but there isn't. This £200 Hero can survive being in water just as well as the Hero 6. That's to say: it's happy in liquid up to 10 metres deep, so ideal for snorkling and diving use. Since the new Hero is the same dimensions and shape as the Hero 6 and Hero 5, you can use any of your existing accessories and mounts too, should you have any. The one notable accessory that isn't supported, however, is the Karma Grip, the handheld stabiliser that helps create some stunning smooth footage with other Hero cameras in the lineup. Shame, but not a big surprise. As for ports and connectivity, there's a small detachable flap that covers the USB-C port, used for transfering your captures and recharging, while the battery compartment opens up on the bottom edge and also houses the microSD card slot. Using the GoPro Hero feels almost exactly the same as using the previous two generations of company's flagship action cameras. You switch it on by pressing-and-holding the Mode button, and then hit the capture button to shoot a photo or record video. Using it is as simple as switching it on and pressing record for the most part. Where you'll notice the biggest difference, if you've used Hero before, is with the options available for shooting. Which actually makes it pretty simple, and easier for first-time GoPro users. In this model, joining the regular video and still photo modes, are the video and photo time lapse and the photo burst modes. And that's it. Using the touchscreen it's possible to change the resolution, frame-rate and field-of-view quite easily for each shooting mode, with only two or three different options within each. There's no ProTune mode for adjusting individual parameters in any of them, though, and no slow-motion mode - both of which are reserved for the higher-end devices and those sorts of video editors who are keen amateurs or pros. There are both upsides and downsides to this. Having fewer and less granular options means a camera that shoots video, photos and time lapses easily and with a minimal learning curve. However, you have a camera that's not as feature rich as its more expensive siblings, or some of its competition in the price range, and there's less to grow into (unless you get hooked and buy the pricier model, of course). Still, if you just want an action camera that presents little in the way of fuss, the GoPro delivers there. While the 2018 Hero lacks 4K Ultra-HD resolution video capture and HDR (high dynamic range) still photos - these are the kind of things higher-end capture fanatics will pine after - the images and footage shot from the camera still decent, although not quite as sharp or well balanced as what you'd get from a high-end smartphone to our eyes. Shooting with the GoPro in bright daylight and the video capture looks good and - although not as dynamic and vivid as the Hero 6 - is plenty good enough for those action videos you want to share with your friends on YouTube or Facebook. In lower light conditions both video and time-lapse left us wanting more colour and dynamic range. Time lapse video has a habit of making footage look a tiny bit washed out and lacking in detail. As for stabilisation, that's another area that could be improved. There is some basic digital stabilisation, but it's not the best for video. When riding over slightly bumpy ground on our electric scooter, for example, there was some shakiness that wasn't tackled by the built in EIS (electronic image stabilisation). This is another compromise over the Hero 6, which has a more advanced stabilisation algorithm powered by the GP1 processing chip. Again, depends what you want to pay for and what you need. One of the benefits of not having 4K UHD resolution (or full HD slow motion at 240fps) like its higher-end family members, is that you don't have to wait for ages for videos to port across to your smartphone. With the Hero paired to an iPhone it doesn't take long to import Full HD footage at all, ripe for the sharing in mere moments. Another plus side of the lower-resolution setup is that it doesn't consume battery life too quickly. When we took it out to shoot the video embedded at the top of the review here, there were still some battery juice left despite having been recording for close to an hour. GoPro claims you'll get at least 80 minutes shooting in 1440p at 60fps, or more than two hours shooting at Full HD (1080p). Our experience has always been a little short of that - as it has been with all GoPro models compared to the claimed figure - but then real-life usage is a mixure of various shooting modes and settings adjustment, so it can be difficult to get an exact measurement. If you want more than an hour's worth of capture then we suggest nabbing a second battery, which can be purchased separately. Despite some minor shortcomings in video quality compared to the full-fat GoPro lineup, the 2018 Hero is still a lot of fun and really easy to use. If what you're after is the best image and video quality from an action camera, you best up your budget and look to the Hero 6 instead. The Hero is all about minor compromise for a more sensible price point, thus its photo and video footage lack a little in sharpness, clarity and colour for it to be a 'serious' capturing tool. But it's perfect for a more casual user. GoPro's strength has long been in the ease of use. The 2018 Hero is a decent entry-level model for first timers, who'll no doubt be drawn to this more affordable purchase. That said, the smaller Session cameras might spell out a better option. The 2018 Hero's bigger brother looks the same, but it's a whole different beast. Higher-resolution capture, more professional modes, Karma Grip acessory support and... well, you guessed it, a far bigger price tag. It's the best action camera going, but only for those who'll need all these features on tap.